10 years ago, The Rev. Callie Swanlund was in seminary at Church Divinity School of the Pacific, participating in a New Media in Worship and Preaching class taught by the Rev. Dr. Micah Jackson. His admonition inspired her and the seeds of a novel idea were planted. Now, her work is coming to fruition with a Kickstarter campaign to fund the How2charist project. This idea is moving forward in exciting ways that Callie could not have imagined at the onset. Callie feels strongly about Christian formation, and the catechesis processes that help people learn why we do what we do. Many churches conduct “Instructed Eucharists” as a way to invite people into the liturgy. But it frustrated Callie that the instruction, while helpful, interrupts the holy mystery and worshipfulness of the sacrament. Furthermore, the instruction extends the length of the service, and distracts from the rhythm and flow of the words. Callie conceived a novel way to instruct people in a way that is both formational and worshipful. Inspiration came from an unlikely source – VH1 Pop Up Videos, a television program that showed music videos overlaid with “pop ups” – small bubbles containing factoids, trivia, and witty commentary. As a project for her New Media class, Callie had imagined celebrating the Eucharist, uninterrupted by explanation, but with relatively unobtrusive bubbles popping up around her, explaining various aspects of the sacramental proceedings. 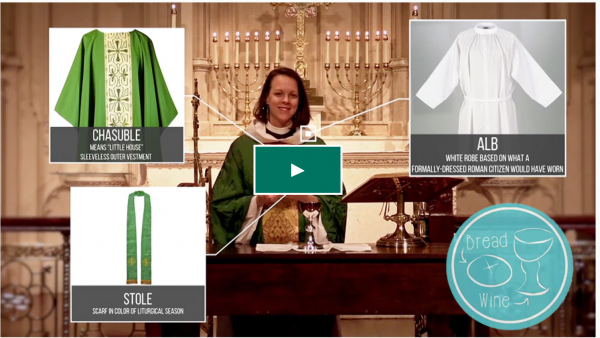 Her original project featured a low-tech version of this idea, walking through the motions of celebrating the Eucharist while a PowerPoint projected informational bubbles around her. Her fellow seminarians loved it and Callie imagined that there might be value in sharing the idea across the church. But she was uncertain as to how to dynamically adapt the pop-up Eucharist concept across a vast variety of contexts and communities. A few years later Callie was asked to lead an adult forum at the church where she was serving as Associate Rector, and enlisted the help of the church’s Communications Director Jeremy Tackett (who is now the Digital Evangelist for the Episcopal Church). The two collaborated and planned for an All Saints’ Day presentation of what they began calling the “How2charist.” In addition to figuring out how to layer video, Jeremy also created a social media promotion. The promo went viral! Since then, at least monthly, Callie has been contacted by seminarians, clergy, and formation practitioners all asking when a full version of the 30 second promo might be available. Almost as frequently, Callie has been in touch with diocese, publishers, and other entities willing to fund the project in its entirety. Yet, Callie imagined a different model, one in which the idea was brought to fruition not through her unique efforts but through the collaborative efforts of many, each with their own context and usage. One priest who serves yoked Episcopal and Lutheran congregations imagined a version that highlighted the similarities and differences in Eucharistic practice. Another priest hoped for a Spanish version. Confirmation classes, newcomer classes, and adult forums all imagined ways they could uniquely utilize this resource. Thinking more broadly, Callie wondered at the meta questions of process: how a single person or a small parish with a big idea to partner with a larger organization or to work collaboratively with a number of different entities and how to find the funding that would bring it to light. Fast forward to today! The current Kickstarter campaign – which is funded at approximately 63% - will fund a full version of the How2charist. Callie hopes to make this incredible resource, which will be created professionally in collaboration with The Episcopal Church communications team, available to all who might use it. In addition, Callie envisions developing and curating resources to support and expand the impact and value of the How2charist, such as a downloadable discussion guide. One wonderful additional opportunity for funders of a certain level is that they will receive Holy Eucharist Illuminated Teaching Cards (digital download and, at a higher level, the printed cards) created by the Rev. Kyle Oliver. Even as she is working to move this project forward, Callie has never lost sight of her original purpose – to increase understanding of the Eucharist, to demystify the trappings and practice to better reveal the holy mystery of the incarnate Christ at the core of the sacrament. She hopes people experience a sense of the beauty and perfection of the sacrament. She wishes to invite people who might be hesitant to engage and partake in the Eucharist, and imagines churches being able to embed a How2charist on their websites as a form of evangelism. Given an intimate view of the sacred meal, such as the apostles might have shared as they gathered at Christ’s feet to pass the bread, Callie, hopes all with feel called to gathering around Jesus’ table.